Red Wine – Chilled? Really? This has been a controversial topic around my dinner table and amongst friends for a few years now… Red Wine – to chill or not? Sometimes wine is a very intimidating subject especially out of your comfort zone (i.e. at a restaurant, business drinks, etc etc..) therefore, I dont know anyone in my circle who is comfortable going out and getting red wine chilled – it’s just not socially acceptable and probably a wine makers worst nightmare – I don’t blame them after knowing what goes into making the delicious beverage (which will come in a later post). I love red wine (that seems clear) so when I crave it on a hot night in the summertime it’s sometimes hard to drink it (esp at happy hour) at it’s normal storage temperature (55 – 57 degrees). So, for a refreshing treat on a summer’s day at a bbq, in Central Park or on the boat I like to chill my red wine by putting it on ice. Although, yes I do not think it is professional or appropriate to ask for this sort of thing at a restaurant or bar etc., I do think it is ok to do while you are casually sipping on a light bodied red wine amongst friends. My Yellow Tail Shiraz for example makes for a perfect red wine cooler and it almost tastes like Sangria and is extremely refreshing! Another good choice and one that is a crowd pleaser is RED CAT. I and another wine lover stumbled upon this at the New York Wine Expo 2011 and it is near and dear to us as the winery is on the Finger Lakes close to Syracuse (our alma mater – Go ‘Cuse!). The wine is called RED CAT (bottle below) and it comes from a winery called Hazlitt 1852 Vineyards. The wine can be transformed from a simple red to RED CAT ON THE BEACH. So if you have a red that is somewhat light bodied and not too complex and you are in the mood for a little spritz of coolness – GO FOR CHILL! Funny enough after having this conversation recently, I stumbled upon this article below about a wine company, marketing a new product – Red wine meant to be chilled. It is a great push for summer and gets consumers excited about trying something new and it serves as another fun summer drink that they can add to your summer festivities – without feeling intimidated! Very interesting and I can’t wait to try this whenever it becomes available in the US! I think there is a trend coming! E&J Gallo Winery is launching a red wine designed to be served chilled in a bid to boost summer sales. Gallo claims that Summer Red is the first red variety from a major wine brand intended to be served cold and not at room temperature. Gallo describes the wine as ‘light, fruity and fresh-tasting’. It has an ABV of 10.5% and the company recommends it is served with lighter foods. Senior marketing director Amy Englehardt said research showed that consumers had ‘enthusiasm’ for the idea of a cold red wine. ‘It challenged people’s perceptions and they found it genuinely intriguing,’ she added. The launch will be supported by a print, online and radio campaign created by The Assembly, as well as sampling. Ads will use the strapline ‘How refreshing!’ to position the wine as an ideal summer tipple. From May, Summer Red will be sold in independent retailers and convenience stores, such as Costcutter and Bargain Booze, as well as the major supermarkets. 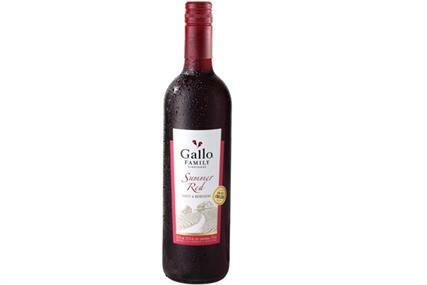 Gallo has dropped its ‘Rose on the rocks’ promotion in bars and pubs to focus on the red-wine launch. The rose campaign, which began in 2007, encouraged consumers to drink rose with ice in an attempt to steer them away from cider. However, the wine-maker is launching a Merlot Rose in the summer. The product, which is the brand’s third rose, is darker and more full-bodied than its existing variants. Bill Robert, general manager EMEA, said the Merlot would ‘enhance (Gallo’s) position as Britain’s favourite rose brand’. Summer wine-drinking has been fuelled in recent years by a boom in the rose market. Over the past decade, sales of rose wine have almost doubled in the UK. Rose now accounts for nearly 12% of the total wine market, with a value of more than £617m, according to Nielsen. whose the other wine LOVAH? Terrific piece of writing, I absolutely enjoy up-dates from you.